Almonds are rich in healthy fats, vitamin E and fiber. Although the almonds you buy at the grocery store contain a small amount of cyanide, it's not enough to poison you. However, eating too many bitter almonds, which you can't get in the United States, may not be so good for your health and may lead to cyanide poisoning. If you suspect cyanide poisoning, go to your closest emergency room for care. The amount of cyanide found in the almonds you buy at your local grocery store isn't enough to cause poisoning. Grocery store almonds, also known as sweet almonds, contain 25.2 milligrams of cyanide per kilogram of weight, according to a 2013 study published in International Scholarly Research Notices Toxicology. For perspective, a typical serving size of almonds is 1 ounce or 23 kernels, and 1 kilogram is equal to 35 ounces. The lethal dose of cyanide is 0.5 to 3.5 milligrams per kilogram of body weight. If you weigh 160 pounds, for the minimum lethal dose, you would need to eat 50 ounces of almonds or 1,150 kernels in one day to get the amount of cyanide necessary to be poisoned. Cyanide doesn't accumulate in the body and is excreted within 24 hours, according to the Centers for Disease Control and Prevention. Cyanide works rapidly and is potentially deadly, according to the Centers for Disease Control and Prevention. Although the gas form that you breathe is the most poisonous, eating cyanide can be harmful, too. It works by blocking oxygen from getting to your cells, causing them to die. If you've been exposed to a small amount of cyanide, you may experience dizziness, headaches, nausea, vomiting, rapid breathing and rapid heart rate. In large amounts, cyanide may cause convulsions, loss of consciousness, low blood pressure, slowed heart rate, respiratory failure and death. If you suspect cyanide poisoning, you need to go to the emergency room right away. The only course of treatment is a specific antidote. Sweet almonds may be safe to eat, but bitter almonds aren't. Bitter almonds are wild almonds and contain 50 times more cyanide per kilogram than sweet almonds, according to the 2013 study in ISRN Toxicology. Eating 50 bitter almonds can be deadly. Although bitter almonds aren't sold in the United States, in 2014 there was a voluntary recall of organic raw almonds from a major health food store chain due to high amounts of cyanide. It turned out these imported almonds from Spain and Italy weren't sweet almonds, but bitter almonds. No illnesses from the almonds were reported, according to the U.S. Food and Drug Administration. The U.S. grows more than 80 percent of the world's almonds, according to the Almond Board of California. Although there haven't been any other recalls from imported almonds, if you're concerned about cyanide poisoning, buying U.S. grown almonds, whether organic or not, may be the safest bet. Don't let the minuscule amount of cyanide in sweet almonds prevent you from including these nutritious nuts in your diet. The fiber and protein in these nuts are filling, so a little goes a long way when it comes to hunger and weight control. Almonds are also high in monounsaturated fat, which is good for your heart and helps lower blood cholesterol levels. For heart health, it's recommended you eat 1.5 ounces of nuts a day, according to the FDA. 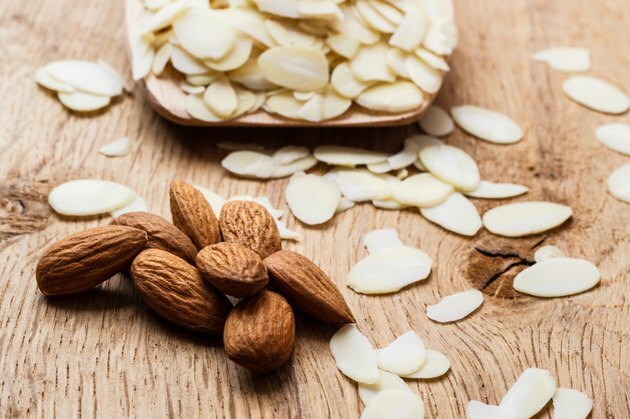 There's also some evidence that the nutrients in almonds may aid in blood sugar control and reduce inflammation, according to a 2007 article published in the Journal of Agricultural and Food Chemistry.